Udon Thani (อุดรธานี, also Udorn Thanee) is a city in the Isaan (Northeastern) region of Thailand. Often referred to as simply Udon or Udorn (อุดร), the city should not be confused with Ubon Ubon Ratchathani in southeastern Isaan. It is approximately 450 km (280 mi) northeast of Bangkok, and is the Capital City of the Province of this name. Please see the following map for the location of the main attractions, sights, and nightlife detailed below . Founded in the 1890s by Prince Prajak Silapakom, Udon Thani, with a population of about 230,000, is the 4th largest city in Thailand. Udon was home to a major USAF airbase during the Vietnam War that increased its wealth and importance. Surrounded by one of the major agricultural areas of the country, Udon Thani has become a regional hub for agriculture, commercial distribution, shopping and a fledgling tourism industry. Because of the U.S. presence (the airbase until 1976, a consulate until 1995, and, now, a Voice of America station) many Thais were well-paid and learned English, making them more marketable to foreign labour recruiters. Udon has a large number of its citizens who have or are working overseas, particularly in Middle East oilfields. This has contributed both to the wealth of the area and its desirability as an expat destination. More than 5,000 expats from Europe, Australia, and North America have settled in the area. Udon Thani International Airport (UTH),  currently has domestic flights to Bangkok (Nok Air, Thai Airways, Bangkok Airways, Lion Air, Air Asia), Chiang Mai (Nok Air, Bangkok Airways) and Phuket (Air Asia). Flights to Bangkok take about one hour. To get to town there is a "limousine service" (actually a minibus) for 80 baht/person that will drop you and other passengers to the place of your choice. If there are more than 2 of you, it may be cheaper to get a Taxi. Minibus tickets are available in the booth just to the right before you leave the terminal building. Some of the hotels and car rental in udon thani] have pick-up service. There are now two bus stations in the city. Bus station #1 is in the city centre, near Central Plaza, a large mall, and a more active area. Another is in the outskirts of town on the road in from Loei towards Nong Khai (bus station #2). From Nong Khai, there is a bus station on Prajak Rd which has buses that go to both Udon stations. They are close in price, but they go to very different areas of Udon: 40 baht to station 1 (not preferred). Old bus, no A/C, far from the city centre, and it makes many stops. 45 baht on a newer, first class bus to station 2 is preferred. If you end up at station 1 and want to go to station 2, there is a songthaew for 10 baht (it may be slow as it picks up other riders) or you can catch a tuk-tuk into town for around 80 baht. But you have to flag down the songthaew #6 or 7 on the main street, not in the bus station 1 (October 2014). Buses from Bangkok (Mo Chit), an 8-hour journey, arrive at the BKS station in the city. Regular busses go from Vientiane to Udon Thani at the bus station in Vientiane at 08:00, 09:00, 10:30, 11:30, 14:00, 15:00, 16:30 and 18:00 and kost 22000 Kip. Best buy your bus ticket a day in advance because the busses are sold out quickly (3 hours or more before departure). The alternative to go from Vientiane to Udon Thani is a minibus with air condition for 130000 Kip (price negotiable) to the Friendship Bridge at Nong Khai and from there with another minibus to Udon Thani (300-1000 Baht, price negotiable). Daily trains go to Nong Khai and over the Friendship Bridge across the Mekong River to Laos. There are also frequent trains to Nakhon Ratchasima and Bangkok. The overnight express sleeper to Bangkok is scheduled for 9.25 hours but usually takes longer. Nevertheless, it is still quite comfortable and pleasant, especially when taken in a sleeping berth or compartment. A daytime express railcar to Bangkok traverses a causeway over the large and scenic artificial lake created by the Pa Sak Jolasid Dam (in Lopburi Province). Connections to the major centres of Southern Isaan (Buriram, Surin, Si Saket and Ubon Ratchathani) can be made in Nakhon Ratchasima (Korat) for those who like to travel by rail. In all, there are daily daytime trains, and three daily nighttime trains from Bangkok to Udon Thani and vice versa (most of which normally originate or terminate at Nong Khai), and several local trains to other destinations, including Nakhon Ratchasima (Korat). Navigation around Udon Thani is made easier by three large roundabouts on the central road, Hwy 2: the clock circle, the fountain circle, and the Prince Prajak Circle. It's also possible to orient yourself with Central Plaza, city centre, or Nong Prajak Park. There is a bypass road that goes around the city. Udon Thani has many samlors (three-wheeled bicycle taxis), although as elsewhere, they are slowly succumbing to the pressures of internal combustion engines. Tuk-tuks, three-wheeled motorcycles, are readily available in most commercial areas. Negotiate a price before taking the ride. Note that in Udon Thani the locally made vehicles (called skylabs) differ from those in most of Thailand outside Isaan in that their fronts are adapted motorcycles. If you travel to Laos, you will see such vehicles (called jumbos) there, also. Udon Thani has a bus-like network of numbered pick up trucks with 2 benches in the back songthaews; cost is 8 or 10 baht per trip (10 baht outside the ring road). There are limited city bus routes. Buses depart at least once per hour after 11:00 to Nong Khai on the Lao border, (40 baht, 1 hour, non-air-conditioned 3rd class bus. You can follow the locals and hop on the waiting #6 songthaew to the bus station or take a tuk-tuk. Bicycles are available for rent at the northeast corner of Nong Prajack Park for 20 baht/hour. Udon has a variety of sights, both in the city and the province, although most visitors make a beeline for Laos or the bronze age excavations east of Udon at Ban Chiang. Phu Phrabat National Park, (60 km northwest of Udon near the Amphoe of Ban Phue.). A marvellous ridge line with numerous sandstone edifices several thousand years old. Bronze age cave paintings are also within the park. 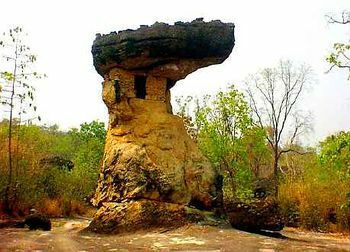 Phu Phra Bat Historical Park is located near Ban Phu and is one of the most famous and beautiful attractions in Thailand. This historical park dates back more than three thousand years and contains large and mysterious rock formations. Transport to Phu Phra Bat is available in the form of motorbike, car, or bus and can take a day to travel and experience it. It is also possible to stay overnight at Phu Phra Bat Historical Park, and this is highly recommended. Phu Phra Bat was opened to the public in 1989 and is maintained by the Fine Arts Department of Thailand. Phu Phra Bat is known to be a very spiritual and peaceful environment and is a must-see for every tourist, whether it be a day-trip or an overnight stay. There is a large night market that opens about 17:00 just west of the train station. Central Plaza, formerly Chareonsri, is Udon Thani's largest indoor shopping mall, featuring 5 floors of shopping, including a Robinson's Department Store, Tops Supermarket, Sizzler Steakhouse, KFC, Pizza Company, Swensen's Ice Cream, Boot's Pharmacy, IT products, mobile phones, Major Cineplex, etc. UD Town, just south of the train station, is a walking mall with a food court, Tesco Lotus store, 3 different Oishi restaurants, McDonald's, Swensen's Ice Cream, Pizza Company, WaWee Coffee and numerous retail businesss. On the eastside is a Makro store (cheap for bulk purchases) and a Big C shopping centre (groceries and department store) with cheaper prices than Robinson's. On the bypass road are numerous big box stores: Home Mart, Global House, Tool Pro Plus, Home Products Company, Index Living Mall, Premium Outlet Mall, Tesco Lotus (x2), Big C, Tang Ngee Soon Superstore. Throughout the city and around are 7-11s and other convenience stores. Many automobile service and filling stations have coffee shops, public toilets, convenience stores, car washes, restaurants, etc. Street vendors abound throughout the city. Satay, noodle soup (beef, pork, chicken, and duck are common), pad Thai, som tam, grilled chicken, meat on a stick, various sweets and rice dishes are available at nearly all times. The fresh fruit market located on the corner of Udon Dutsadi and Phonpisai Rd also offers some interesting food for those wanting to try traditional Thai food. Udon Thani has a large range of buffet restaurants including Korean-style, cook-it-yourself BBQs in a raised dish over a charcoal burner in the centre of your table. There is one located about 2 km north of the ring road on Mittraphap Rd with great food and helpful staff, just make sure you have the number of a tuk-tuk for the return journey. All of the shopping and strip malls have food courts and many have restaurants. There are many Thai restaurants throughout the city. Some are small and specialize in a few dishes while others are large and have extensive menus, although sometimes only in Thai. Western, Japanese, Korean, Chinese, and Vietnamese food is also available. Udon Thani has a variety of karaoke bars, beer bars, and Western bars. The area between Central Plaza and the railroad station houses some of these. Bar names and ownership are fluid, particularly for Western bars. Many of the hotels in town have lively nightlife with restaurants and music. There are many hotels in town. Prices vary, and as with most things, you get what you pay for. Rates can range from 200 to 2,000 baht or more per night. Apartment rentals from 1,800 baht/month. Private pool villas can be rented for catered stays of two nights or more. Nong Khai (หนองคาย) is well-worth a visit. Things to do there include a famous Sculpture Park, the Taa Sadej Market, and the river front festival every Saturday known as Walking Street. To get there, take a bus from either bus station in Udon: the older one inside the city (better choice) or the newer one a few kilometres distant. As at Aug 2014, there were no buses noted to here at either bus terminal. There were regular minibuses from both however, costing B50. NOTE: For the direct buses to Vientiane and Vang Vieng, you MUST have a valid visa for Laos in advance if your nationality requires a visa to enter Laos. If you do not have a visa and you require one, the buses will not sell you a ticket or wait for you at the border for a Visa-on-Arrival to be processed. This is true even if you can get a Lao visa on arrival at the Friendship Bridge. Their rule is "No Visa, No Ticket". Tickets can only be purchased the day of travel. You also must go to the bus station and buy your ticket in person along with showing a valid passport and valid Laos visa. Vientiane, the capital of Laos, is about one and a half hours away across the Mekong. There are six express buses a day direct to the Morning Market in Vientiane (80 baht, 2 hours, air-con 1st class departures at 08:00, 10:30, 11:30, 14:00, 16:00, and 18:00). These cross-border buses will carry passengers who have not obtained their Lao visas in advance, but may NOT wait long enough at the border for a visa on arrival to be applied for and issued. This isn't a problem when the queues are short, but at busy times passengers who don't already have their visas may be left behind and have to continue by local bus or tuk-tuk. Alternatively regular minibuses (every 30-60 minutes) are available from out front of Central Plaza for 50 baht direct to the Friendship Bridge. If you are travelling directly from the airport then you can take a minibus (directly on the right-hand side next to the exit of the airport) to the Friendship Bridge for 200 Baht. Fill out the leaving forms for Thailand there and buy a bus ticket for 20 Baht to the other side of the bridge. Arrived there you may apply for a visa (photo 2x3 cm and up to US$ 40 required, depending on your country of origin!). The staff is very friendly and helpful and there are free toilets. You need another US$ to pass the barrier to be officially in Laos. From there you may take a tuk-tuk, bus, minibus or taxi to Vientiane. You should calculate at least 30-60 minutes for the border formalities, depending on the length of the queues and the availability of pens. Bring your own pen to save some time. Vang Vieng, A direct bus is available from the main Udon Thani bus station (Bus Station 1, near Central Plaza). The bus leaves Udon at 7 am and takes approximately 7 hours to reach Vang Vieng. This bus can also be boarded at Nong Khai (830 am departure). The one-way fare from Udon to Vang Vieng is 320 baht. Kalasin - Minibuses go from the in town bus station every 30 minutes from 7.30am. Takes three hours and winds around the countryside in the process. Cost B160. This page was last edited on 16 April 2019, at 03:06.